Using Zoom Presenter INSTANCE manager is the simplest method to create and run Zoom Presenter instances with unique Configuration, share path and TCP port. If the need arises to manually create Zoom Presenter shortcuts, this section will guide you through the process. Once the EXE's path is specified, a shortcut name prompt appears. Select an appropriate name to make it easy to distinguish when multiple Zoom Presenter shortcuts are created. Zoom Presenter receives the Screen name, Share Path, Configuration file name and TCP Port number using command line parameters. After creating the Windows shortcut, right-click the shortcut and select 'Properties'. "C:\Program Files\Zoom Presenter\zplayer.exe" "/Title:Screen 4-2020" /TCP:4770 "/SharePath:Z:\Media Sharing\" "/Config:Z:\ZPConfig\ZP_4770.local"
Specifies Zoom Presenter's screen instance name used to identify the screen instance. To control multiple, separate instances of Zoom Presenter running on the same PC, each instance must use a unique TCP port number value from 1024 - 65535. To associate a Zoom Presenter instance with a Zoom Commander screen entry, specify Zoom Presenter instance's TCP port number in Zoom Commander's Add Screen dialog. The share path folder is made remotely accessible to Zoom Commander for the creation of playlists and presentation scheduling. 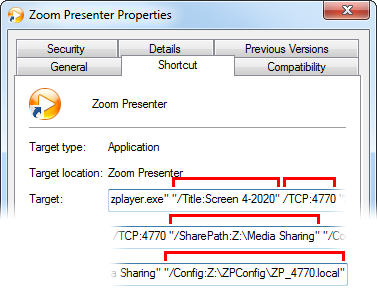 Each Zoom Presenter instance should use a unique configuration file name to prevent conflicts with other Zoom Presenter instances running on the same PC. Select an appropriate configuration file name to make it easy to distinguish when multiple Zoom Presenter instances are running. With the new shortcut created, double click the shortcut to run Zoom Presenter. Each Zoom Presenter instance is represented as an icon on the Windows Task Bar's tray area. To close an instance, right-click its tray icon and select the 'Exit Player' option.